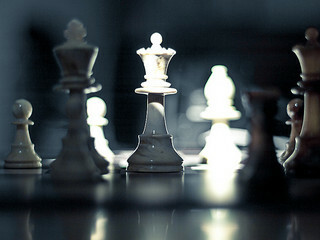 Home » Chess , Daniel , Eschatology , Evil , King , Matthew , Satan , The Devil , Theology » Chess Anyone? Most of us have heard the illustration of the battle between heaven and hell, between God and Satan, described as a chess match with God playing the white and Satan playing the black - two masters locked in infinitely intricate strategy with the fate of the world and of eternity itself hanging in the balance. I like to view it as not a single game, but as a long series of games that they play with God winning a few and Satan winning a few. At least this, I believe, is pretty close to how Satan sees the conflict. He congratulates himself after every brilliant move and imagines God on the other side of the board sweating out every game as the battle of wits rages on. The reality of the situation, however, is quite different. The chess match is not one of two equals, but one between the true master and the upstart headstrong and cocky student. It is true that the master wins some of the games and the student wins others. Every time that the student wins a game, he celebrates wildly, gloats, and taunts his master with slurs and curses. When he loses, he pouts, becomes angry, and throws temper tantrums. All the while, the master sits calmly with a slight serene and knowing smile. After each game, win or lose, the master places the completed board behind Him, lining it up will all of the other finished games, and begins a new game. While it seems to the student that he is winning most of the games, and he is very excited about this, there is a problem. He is focused only on the number of wins versus the number of loses. The master, however, has a bigger goal in mind. He is not actually playing chess at all, but instead is creating his perfect and eternal masterpiece. If you can imagine yourself rising above the game and looking down on the finished game boards that God has placed behind Him you would begin to see a breathtakingly beautiful picture taking shape out of the used pieces. You would begin to see that God was using every game to complete His perfect work and that He was not focusing on playing chess with Satan at all, but was instead working out His perfect plan for eternity in intricate detail. Win or lose the games, every single piece ends up exactly where God intended it to be before the game even began. Just like in chess, there is a certain point when a player gets trapped and checkmate becomes inevitable, so too is the series nearing its completion. Jesus dealt the fatal blow with His victory on the cross. While there are still moves to be played out, the result is certain. The picture is nearly complete. The victory is won.